Coverchuk took Cuckoo Kong from the Girletz’s to a score of 89 points in the championship round on the way to the victory. At this point in the season, the Meadow Lake, SK man sat 53rd in the world standings and fifth in Canada. The win in Southeast Saskatchewan moves him up even further for both. Second on the evening went to fellow Saskatchewan man and two-time Canadian Champion Dakota Buttar. Coming in, Buttar ranked fourth in Canada and 61st in the world, adding another 30 world points and $2,041 in earning in Manor. Montana’s Dakota Louis took third on the evening while Australia’s Will Purcell finished in both the fourth and fifth spots. The following are the official results from the 10th edition of the Manor Fun Daze PBR on July 23rd 2016. Round one: 1. Dakota Buttar on Girletz Rodeo Stock’s 962 Wanderlust, 85.5 points, $494.70; 2. Cody Coverchuk, 84, $371.03; 3. Dakota Louis, 83.5, $247.35; 4. Will Purcell, 82.5, $123.68; 5. Will Purcell, 76; no other qualified rides. Finals: 1. Cody Coverchuk on Girletz Rodeo Stock’s Y70 Cuckoo Kong, 89 points, $494.70; no other qualified rides. Aggregate, total money and points earned: 1. Cody Coverchuk – Meadow Lake, SK – 173 points on two bulls, $3,731.68, 60; 2. 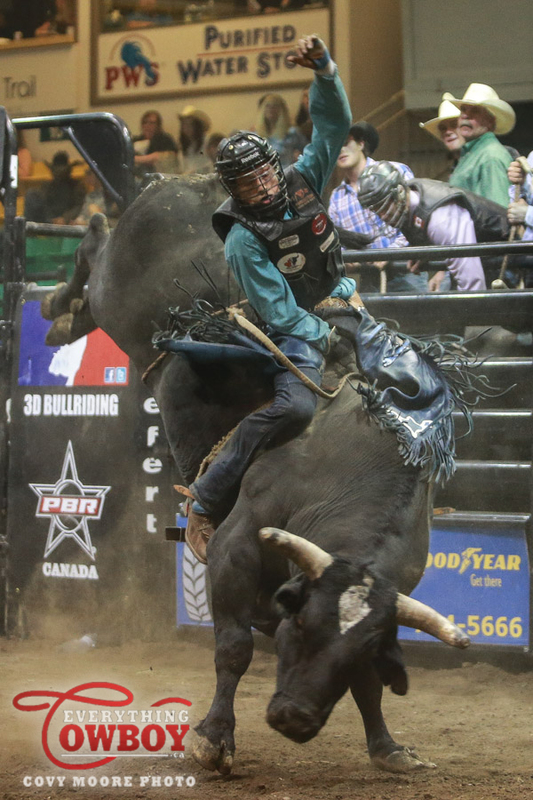 Dakota Buttar – Kindersley, SK – 85.5 points on one bull, $2,041.46, 30; 3. Dakota Louis – Browning, MT – 82.5, $1,226.96, 20; 4. Will Purcell – Merjing, VIC. – 82.5, $804.71, 15; 5. Will Purcell, $450.17, 10. Next up on the 2016 PBR Canada Schedule is the Gold Eagle Casino PBR Classic in North Battleford, SK on July 28th. 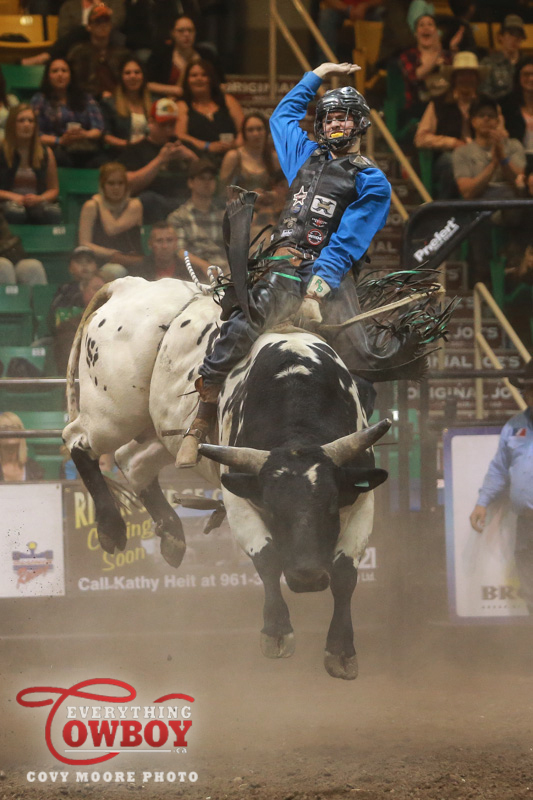 WANHAM, Alberta — Australian bull rider Josh Birks earned his second event win in the past three years at the Wanham PBR Extravaganza on Friday night. To top it off, he also tamed the Nufarm Bounty Bull, Vold/Prescott’s Quag’s Back for the $10,000 bonus. None of this would have been possible however if it weren’t for the work of Blaine and Daphne Fyson, Lynette, Stacey and the whole crew at the Wanham Plowing Match. After eight inches of rain in the days leading up to Friday night, the old arena was being worked up Friday morning but couldn’t be saved. At 1:30pm on Friday afternoon the decision was made to move the entire set up, which was already done once. At 7:15pm a number of bull riders along with volunteers and Blaine in the bobcat, sand was put down over the fresh grass of the new arena, just in time for the 7:30pm start time. It all went off without a hitch, allowing these riders the opportunity to make their living while providing the finest bull riding in the peace country in front of hundreds of fans. In round one for Birks it was Blood Money from the Young Money Cattle Company with a score of 83 points. An 88.5 on Black Rose from Vold Rodeo earned him the event win for a shot at the bounty bull. A total of $3,609.95 was in the Aussie man’s pocket before he even attempted Quag’s back on the arena built hours before. After Wanham, Birks likely jumps inside the top five in the PBR Canadian standings for points and will lead the pack in money won at over $19,000. In addition, he adds 60 points to his PBR world standing. Second on the night went to Ty Pozzobon, one of the main men in the arena before hand shoveling the sand around to be sure the bulls had adequate footing. Pozzobon rode Missing Vibrations from the Wild Hoggs for 86 points to win the first round. In the finals, the BC man went a long ways on True Blood from the Vold/Prescott firm but it wasn’t enough. For his work Pozzobon took home over $2,400 in earnings and 30 points towards the PBRs world standings. Third in Wanham went to 2006 Canadian Champion Bull Rider Tanner Girletz now of Bowden, AB. Girletz tamed Jersey Lick from Vold/Prescott for an 84.5 in round one, coming down from his final round mount. He took home $1,581 and 20 world standings points. Rounding out the top five were Cody Coverchuk of Meadow Lake, SK and Fabian Dueck of Paraguay. Unofficial results from the Wanham PBR Extravaganza on June 17th, 2016. Round one: 1. Ty Pozzobon on Wild Hoggs’ 100 Missing Vibrations, 86 points, $632.40; 2. Tanner Girletz, 84.5, $474.30; 3. Cody Coverchuk, 84, $316.20; 4. Josh Birks, 83, $158.10; 5. (tie) Kale Marks and Cody Coverchuk, 81.5; 7. Cawl Braithwaite, 81; no other qualified rides. Finals: 1. Josh Birks on Vold/Prescott’s 111 Black Rose, 88.5 points, $632.40; 2. Fabian Dueck, 83.5, $474.30; no other qualified rides, $237.15 ground money each. Ride off: Josh Birks on Vold/Prescott’s 128 Quag’s Back, 88.5 points, $10,000. Aggregate, total money and points earned: 1. Josh Birks – Coonamble, NSW – 171.5 points on two bulls, $13,609.95, 60; 2. 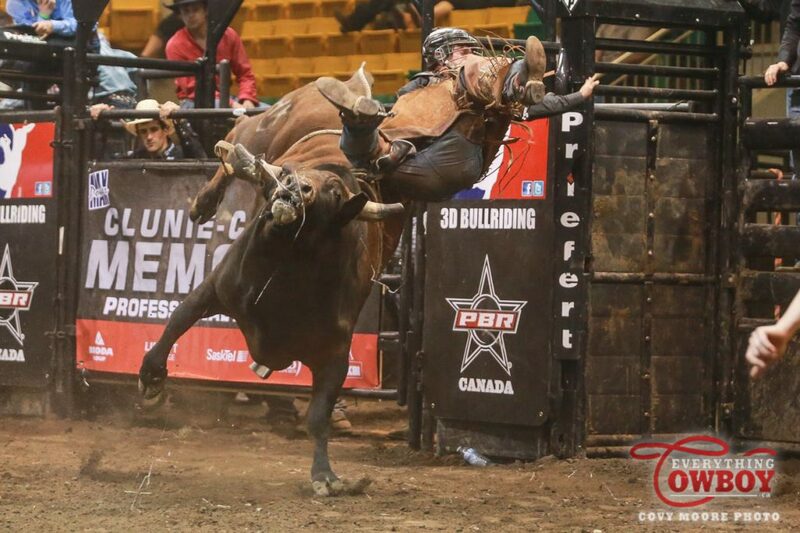 Ty Pozzobon – Merritt, BC – 86 points on one bull, $2,476.90, 30; 3. Tanner Girletz – Bowden, AB – 84.5, $1,581.00, 20; 4. Cody Coverchuk – Meadow Lake, SK – 84, $1,054.00, 15; 5. Fabian Dueck – Paraguay, $1,154.13, 10; 6. Cody Coverchuk – Meadow Lake, SK – 81.5, $258.23, 5; 7. Kale Marks – Sunnybrook, AB – 81.5, $258.23; 8. Cawl Braithwaite – Bluffton, AB – 81, $147.56. Next up on the 2016 PBR Canada schedule is Ride, Rock and Roll presented by the Ponoka Stampede featuring Big Sugar and 54-40 on Saturday June 25th, 2016. North Dakota’s Nathan Schaper earned some much needed points in Prince Albert. Schaper put together a pair of scores to finish second on the night for 30 points towards the PBR world standings. Depending on how things shook down this weekend in Uvalde, TX he could rank as high as 34th. Saskatchewan man Tim Lipsett won the first round of the evening with an 87 point effort on Open Season from the Wild Hoggs. Lipsett would not cover his final round bull but ended up with 20 world points and $1,887.70 in earnings. Rounding out the top six were British Columbia’s World Finalist Ty Pozzobon, Jordan Hansen and the man who Shay Marks now is in a tight race for number one, two-time Canadian Pro Rodeo Champion Dakota Buttar. The first ever ABBI sanctioned Classic took place in Canada as part of the Clunie-Cooper Memorial PBR. Young Money Cattle Company/Hy-Kik Ranch’s 124 Story of the Stars took the title for $4,000 in earnings. The top Futurity and Classic bulls in Canada make their way to Las Vegas this fall for the first time. Round one: 1. Tim Lipsett on Wild Hoggs’ 193 Open Season, 87, $663.00; 2. (tie) Shay Marks and Ty Pozzobon, 86.5, $414.37 each; 4. Jordan Hansen, 83.5, $165.75; 5. Nathan Schaper, 78.5; 6. Dakota Buttar, 76.5; no other qualified rides. Finals: 1. Nathan Schaper on Vold Rodeo’s 825 Feeling Blue, 81 points, $663.00; 2. Shay Marks, 80, $497.25; no other qualified rides. Shay Marks rides Wild Hoggs’ King Pin to win the Clunie-Cooper Memorial PBR in Prince Albert, SK on May 7th, 2016. Photo by Covy Moore. 1. Young Money Cattle Company/Hy-Kik Ranch’s 124 Story of the Stars, 89.75 points, $4,000; 2. Flying High Rodeo Co.’s X220 Twenty to Life, 87.5, $3,000; 4. 3. Pozzobon Cattle/Prescott Bucking Bulls/Patten’s 225 Big Tymer, 87.25, $2,000; 4. Two Bit Bucking Bulls’ 292 Pain Killer, 86, $1,000. Blankenship covered Black Rose from Vold Rodeo for a score of 86.5 to tie for the long round win with two-time Canadian Champion Dakota Buttar of Kindersley, Saskatchewan. In the finals, the North Dakotan put up the first score ever, 88.5 points, on the back of Checkered Flags from the Wild Hoggs. Buttar put up his 86.5 from the first round on the back of ABBI Classic bull contender X402 Cryin’ Wolf from Big Chief Bucking Bulls. In the finals he was a half point off the win, putting up an 88 on Liquid Fire, also from the Wild Hoggs. For their efforts, Blankenship earned $4,014.84 and 60 world championship points while Buttar adds $3,075.59 to his 2016 campaign and takes over the number one spot in the PBR Canadian Standings. Saskatchewan’s Justin Lloyd covered two bulls on Friday to place third on the night while Nathan Schaper of North Dakota and the PBR’s BUilt Ford Tough Series and Washington’s Cody Casper rounded out the top five. The following are the unofficial results from the Clunie-Cooper Memorial PBR in Prince Albert, SK on May 6th, 2016. Round one: 1. (tie) Dakota Buttar on Big Chief Bucking Bulls’ X402 Cryin’ Wolf and Riley Blankenship on Vold/Prescott’s 111 Black Rose, 86.5, $580.13 each; 3. Nathan Schaper, 86, $331.50; 4. Jake Wilson, 85, $165.75; 5. Justin Lloyd, 82; no other qualified rides. Finals: 1. Riley Blankenship on Wild Hoggs’ 293 Checkered Flags, 88.5 points, $663.00; 2. Dakota Buttar, 88, $497.25; 3. Cody Casper, 85.5, $331.50; 4. Justin Lloyd, 84.5, $165.75; no other qualified rides. Aggregate, total money and points earned: 1. Riley Blankenship, 175 points on two bulls, $4,014.84, 60; 2. Dakota Buttar, 174.5, $3,075.59, 30; 3. Justin Lloyd, 166.5, $1,390.46, 20; 4. Nathan Schaper, 86 points on one bull, $1,169.46, 15; 5. Cody Casper, 85.5, $860.06, 10; 6. Jake Wilson, 85, $539.61, 5. Riley Blankenship rides Checkered Flags from the Wild Hoggs for 88.5 points. Photo by Covy Moore. Official ABBI Classic results from May 6th, 2016 in Prince Albert, SK as part of the Clunie-Cooper Memorial PBR. 1. Young Money Cattle Company’s 124 Story of the Stars, 89.75 points; 2. FHRC X220, 87.5; 3. 2BIT 292, 86; 4. BCRC 263, 84.25; 5. BCRC X402, 84. Young Money Cattle Company’s 124 Story of the Stars puts up a score of 89.75 points in bucking off Cawl Braithwaite on night one of the Clunie-Cooper Memorial PBR at the Art Hauser Center in Prince Albert, SK on May 6th, 2016. Photo by Covy Moore. The second and final night of the 2016 Clunie-Cooper Memorial PBR in Prince Albert, SK takes place on Saturday May 7th at the Art Hauser Center starting at 7:30pm.